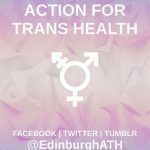 Edinburgh Action for Trans Health is a local chapter of the @Act4TransHealth national organisation, fighting for democratic access to health care and trans liberation. The group meets at Ace and if you’d like to come along, please email the below address. Check out our Facebook, Twitter and Tumblr accounts for more information.